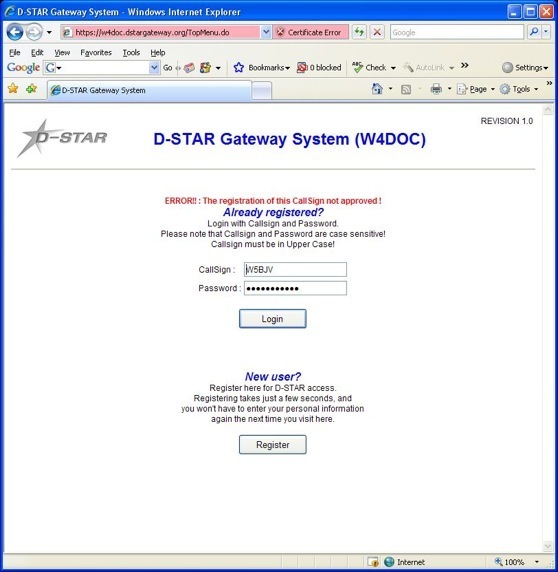 In order to use the NC2EC D*Star Gateway, you must register on the Gateway. 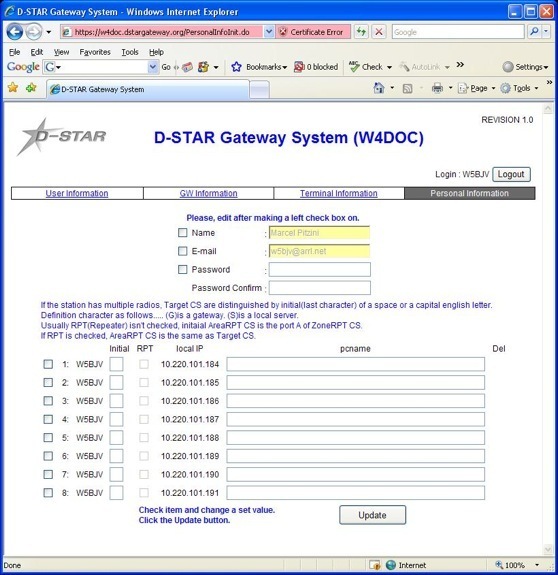 Open a web browser and enter https://dstar.nc2ec.org/Dstar.do -OR- http://www.dstarusers.org/repeaters.php and find the D-Star repeater system closest to you. Click on the link after “Registration URL:” for your repeater. 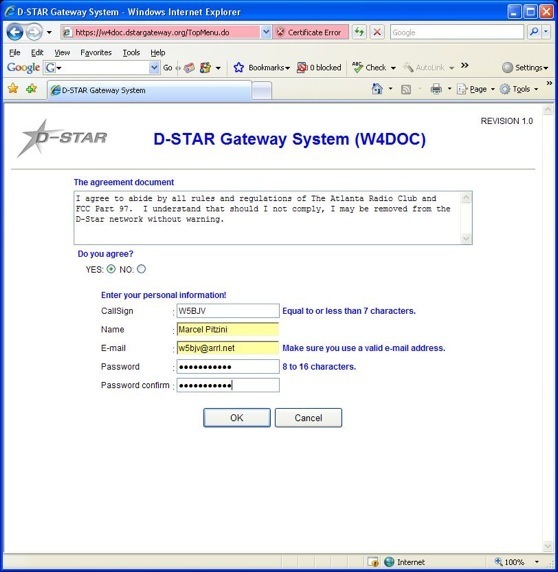 For example, if you live in Georgia, scroll down to W4DOC and click on https://w4doc.dstargateway.org/Dstar.do. If a “Registration URL:” is not listed for your closest repeater, contact the administrator of the repeater for instructions. Notice that you are using https and not http for the prefix and that the letter “D” is capitalized in the word “Dstar.do”. You will receive a warning similar to the one below. 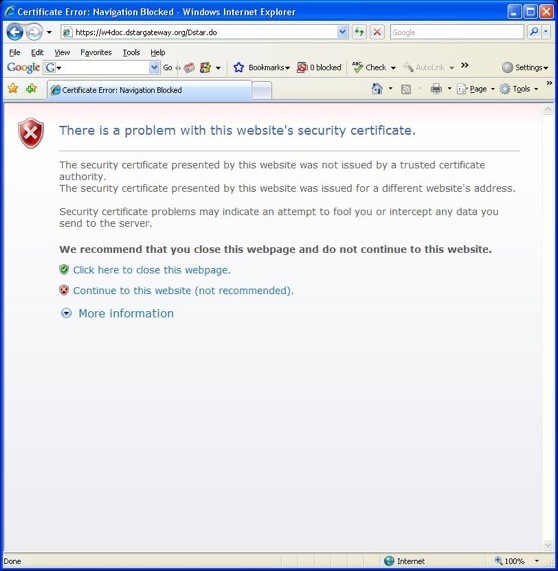 Select “Continue to this website” if using Internet Explorer, or “Accept this certificate temporarily for this session” if using Firefox, or “Continue” if using Apple Safari. To register your callsign with the D-Star network, please follow the steps listed below. Should you have any problems with registration, send email using this form and include your name, callsign, and problem description. ‣2. You should see the web page shown below. Click “Register” to begin the New User registration process. ‣3. You should see the web page shown below. Click “Register” to begin the New User registration process. The following web page should be displayed. ‣4 Click on “Yes” to agree to the registration terms. Enter your callsign in the Callsign field IN UPPER CASE. Enter your full name in mixed case, and your email address. Enter your new password in both fields. Passwords must be at least 8 characters in length and no longer than 16. Your web page should look similar to the one below (with your personal information shown). Click “OK”. ‣5 The following popup window should be displayed. Click “OK”. ‣6 The following web page should be displayed. Click “OK”. Your registration request has been submitted for approval. The gateway administrator must now log into the system to approve your request. The approval may happen quickly or it may take a day or two depending on how often the adminstrator logs into the system. ‣7 You should try to log in periodically to check on the status of your registration. 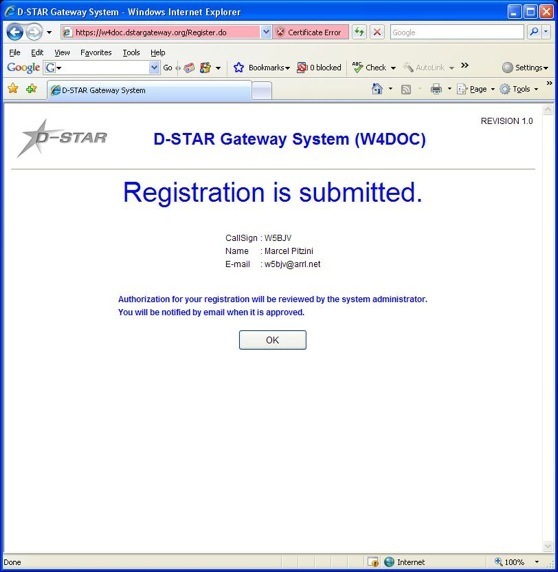 Use the same URL listed in step 1, https://dstar.nc2ec.org/Dstar.do and use your callsign (IN UPPER CASE) and the password you entered during registration. If your registration is pending approval, you will see the following web page. ‣8 Once your registration has been approved, you will be able to log into the system and configure your personal information. THIS STEP IS REQUIRED. Once you are logged in, click on “Personal Information” at the right of the page. You should see a web page similar to the following. ‣9 Click on the checkbox next to the number “1”. Then click inside the “Initial” box to the right of your callsign on the same line as the number “1”. Type in a single space character. This will not show up but is very important. Do not click on the “RPT” check box. In the “pcname” box, enter your callsign in lower case followed by a dash “-” followed by your type of radio, e.g. 2820 or dvdongle. All characters in the “pcname” box should be lower case and there should be no spaces. Your web page should look similar to the following page (with your personal information shown). When complete, click on “Update”. ‣10 Once you have clicked “Update”, you should see the following popup box. ‣11 Click “OK” and your registration is COMPLETE! 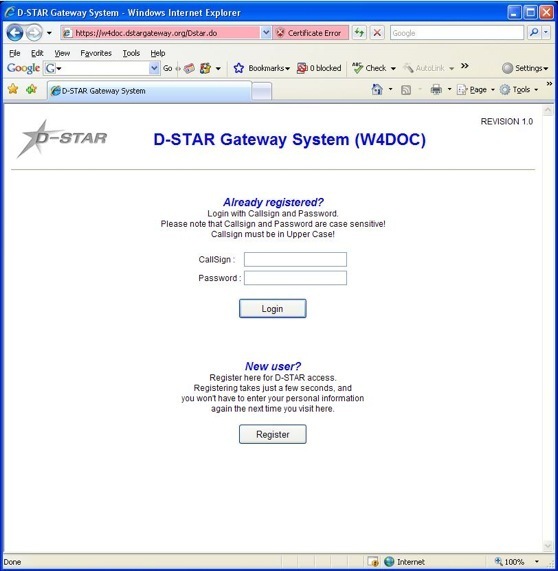 You may log out and begin using the D-Star network.